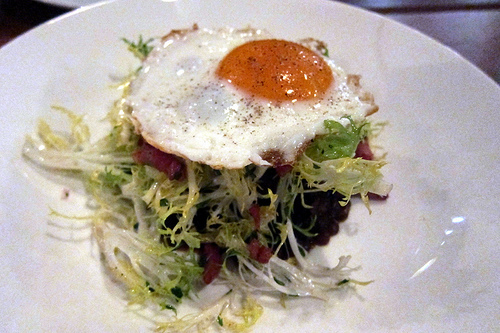 Years in the making, Chef Walter Manzke’s Republique is now open. My fine dining partner and I made reservations but it turned out the restaurant wasn’t officially open yet. Luckily for us, the restaurant was honoring the Opentable reservations. Although not fully opened, the restaurant was quite busy with many people at the bar and parties scattered throughout the restaurant. There’s mostly communal dining and we took seats at the end of one long table. I had a slightly obstructed view of the kitchen. As always, I’m fascinated by the ballet of the line. Chef Manzke could be seen checking plates before they went out but also was free to greet other fellow chefs who came in to congratulate him on the opening. Mostly though I observed bartenders walking to the huge tub full of chilled wine in front of our table. Although we were tempted, we ordered cocktails instead. We may have (definitely) ordered too many dishes for two people but we were very excited to try Republique. I tried to order things I hadn’t had before from Chef Manzke though I know some of the things we did order are from his classic repertoire like the escargots en croute. 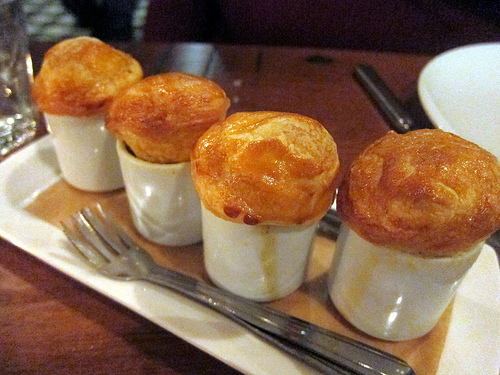 The tiny puff pastry ensnared snails were very nice. I opted to pop off the top, pluck out the snail and then drizzle some of the luscious garlic oil onto the pastry for consumption. Cocktails are from Erik Lund (formerly Rivera, MessHall). The short list a mix of classics and creative garden to glass cocktails. I did find the menu a bit mysterious as some of the cocktails don’t list all the ingredients. For instance, the Fair Hills Farm Fuji Apple must make use some of the said Fuji apple but it’s not part of the ingredients. In any case, it did taste like a really great boozy fresh pressed cider. 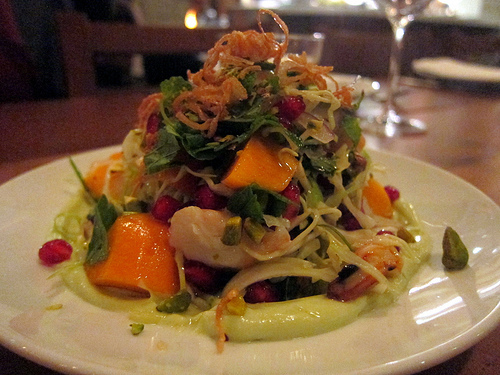 The pig head is another classic Walter Manzke dish that I never got to try. I’m so glad we ordered this. 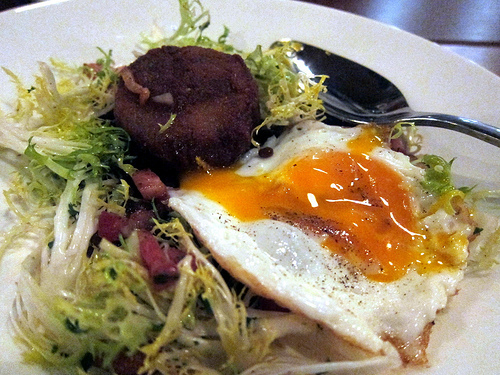 I liked the combination of fresh greens, crispy disc of pig face and beautiful farm egg. Lentils and bacon complete the dish. 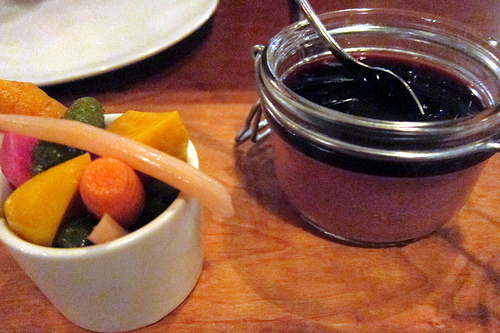 Considering all the dishes we ordered, we decided to just get the duck liver mousse instead of a charcuterie board. I must come back and get that as it looked magnificent. I suppose the good thing about communal dining it’s not too strange if you look over at your “table mates” food. The duck liver was rich and went very well with Republique’s house made baguette. We had to get another thing of bread to finish off the rest of the liver. I wonder if Chef Manzke would consider doing banh mi again? As mentioned the cocktail list seemed to have left off a few ingredients for their cocktails. 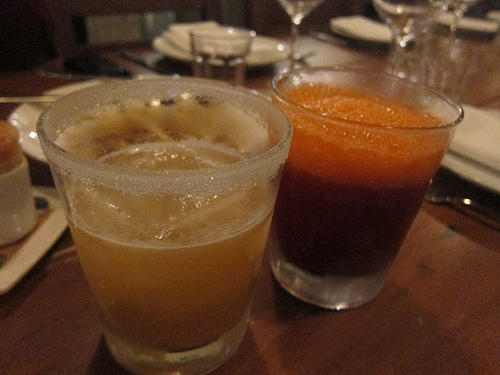 The California Carrot, a bright orange cocktail, lists only mezcal and beet jam. I actually hate carrots but I still wanted to try it. 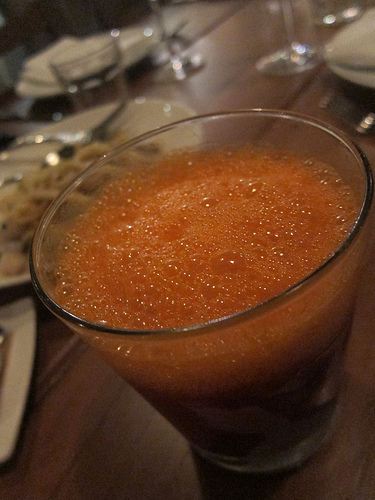 It turned out to be a perfectly balanced drink and not like a health food nut’s morning drink. Of course, the mezcal doesn’t hurt. One of the stand out dishes was the gulf white prawns. The slightly spicy sauce played well with the cabbage and persimmons. There were layers of flavor I usually find in great Vietnamese food. This would be a dish I’d order over and over again. When we ordered the beignets with porcini mushrooms, it turns out they were not sutffed with mushrooms but the ‘shrooms showed up as a sauce under the fluffy beignets. This was a generous serving for a small plate. The two of us had trouble finishing this as more of our food was starting to hit the table. My friend ordered a Sidecar on the rocks. Nice to see that big rock in there! 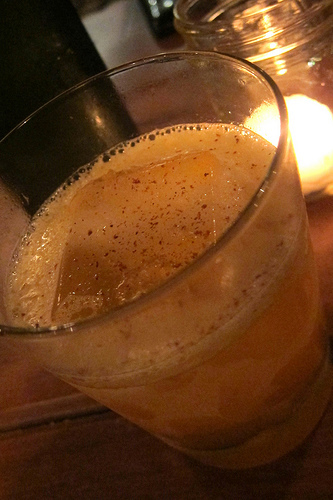 I always love telling people Sidecars are cognac margaritas. My favorite dish of the night turned out to be the artichokes. 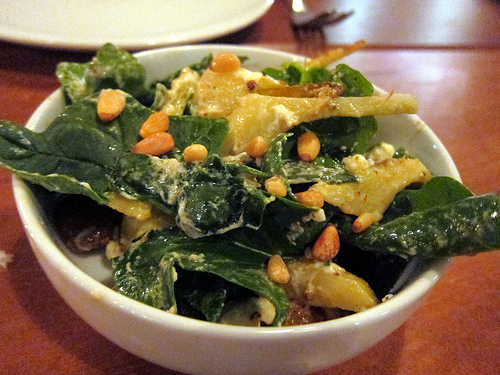 They were tossed with a creamy goat cheese, pine nuts, spinach and mustard vinaigrette. 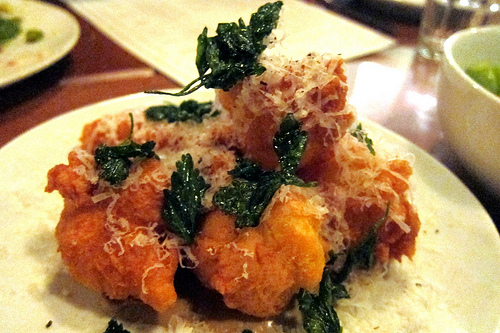 I could eat buckets of this dish. The spinach was so fresh and all the flavors worked well together. 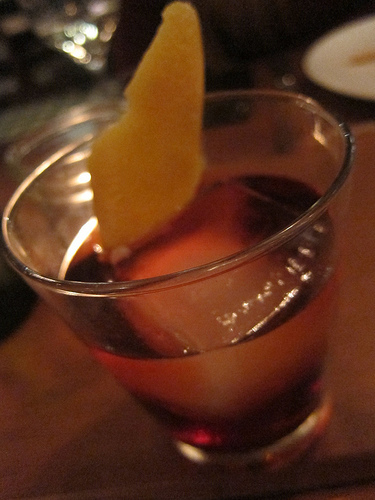 Listed on the menu as made with the “usual suspects,” the Negroni Royale also was mixed with a sparkling rose wine which made it just a bit fizzy. If there was a hashtag for this, it’d be #negroniallday. 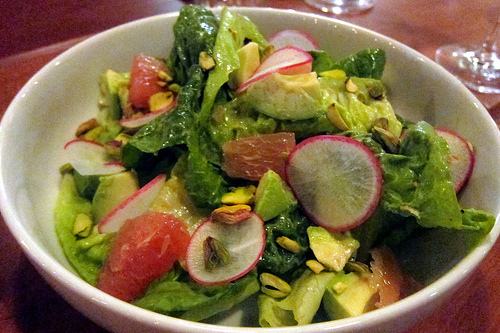 The County Line little gem salad was good though I preferred the white gulf prawns with cabbage as a “salad.” I did really enjoy how fresh the avocado and pomelo were. 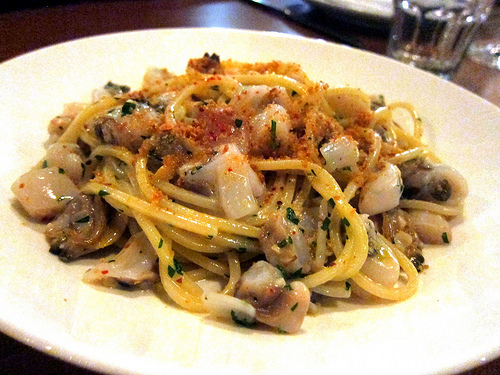 The chitarra came with both Manilla and razor clams. I was really excited about this dish but it arrived nearly cold. Unfortunately though the most offending part were the clams were very sandy. My fine dining partner also did not enjoy how the razor clams were practically raw with an unpleasant texture. We love sushi and crudo but this was not good. When I mentioned this to a passing manager, they said they’d make a note of it. I surely hope this dish improves as the sauce was good. Making up for the bad shellfish pasta was a very good fish dish. 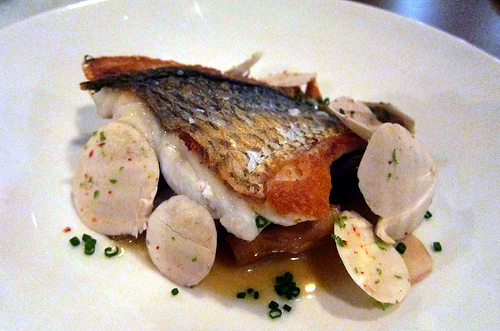 The Tai snapper was well-cooked with an array of mushrooms. We liked this dish very much. I was pretty much done but we couldn’t leave without dessert. 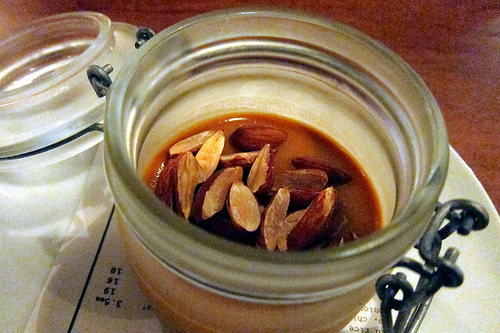 The caramel pot de creme sounded nice and light. After a couple of spoonfuls of this, my sweet tooth was satisfied. I can’t wait to return to explore of the menu. The eggs on toast looks fantastic with both uni and soft scrambled eggs. I’d also would like to try the scallops, duck confit and ribeye.